These profound Sun Tzu quotes reveal his wisdom and explain why people are still reading “The Art of War” more than 2,500 years later. Even after more than two millennia, The Art of War by Chinese philosopher and military strategist Sun Tzu remains one of the most respected treatises ever written on the subject of warfare. Yet, despite being so influential, surprisingly little is known about the man and his most famous work. Though Sun Tzu is often thought to have lived during the fifth or sixth century B.C., scholars aren’t sure. 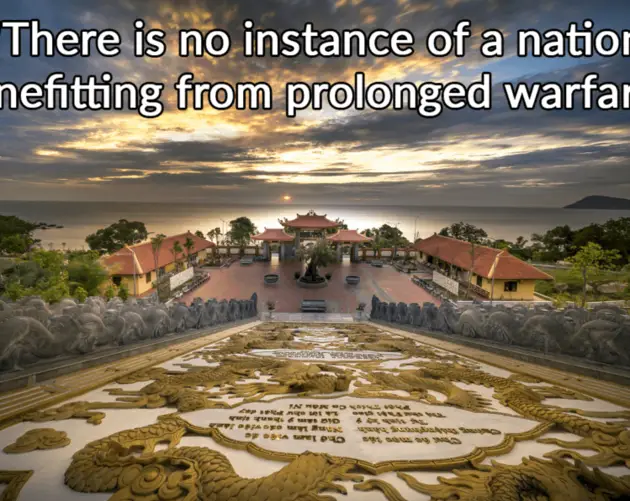 And though he’s widely known as Sun Tzu in the West, he’s alternately known as Sunzi, Sun Wu, and Chang Qing elsewhere in the historical record. What’s more, it’s not even certain that he was, in fact, a real person. While some historians refer to a Sun Tzu who lived in eastern China around the turn of the fifth century B.C. and served King Helü of the Wu state, other modern scholars argue that no such man ever actually lived. Instead, these scholars claim, The Art of War is a collection of writings that originated with various people and were simply compiled over the years. Perhaps all of the most famous Sun Tzu quotes still known around the world today were not actually the work of any one man named Sun Tzu at all. But whatever the truth about the man, The Art of War soon became essential reading. Throughout eastern Asia, The Art of War was read by generals and strategists everywhere starting in the last few centuries B.C. In the West, The Art of War didn’t begin to see attention until its late 1700s translation into French, with an English translation only coming at the dawn of the 20th century. And while Western audiences began to devour the book and the wealth of now-famous Sun Tzu quotes inside, east Asian leaders continued to draw upon its wisdom as well. Mao Zedong, the man who united China in 1949 under the Communist Party after the Chinese Civil War, was able to successfully defeat the Nationalist armies in part through guerilla warfare, which he reportedly learned by studying Sun Tzu. Today, The Art of War influences more than just military strategy. Everyone from business leaders to sports coaches studies the work of Sun Tzu. As odd as it might sound, The Art of War has transcended warfare. See for yourself in the gallery of Sun Tzu quotes above. After this look at Sun Tzu quotes, check out the most interesting quotes you’ll ever read. Then, experience some of the best inspirational quotes about death.